UNITED NATIONS, October 7 -- When the UN Security Council's Committee on the Admission of New Members convened Friday morning down a long cement hallway in the UN's North Lawn building, the sign outside Conference Room 7 said only "Closed Meeting," with no hint of the topic. Nor was the meeting listed in the UN's daily Journal. By contrast, when a meeting of the Council, similarly at the "expert" level, was held on October 5 in Conference Room 6, the sign outside disclosed "On the Presidential Statement on SSR," Security Sector Reform. Inner City Press was allowed to stand directly outside that meeting and ask participants questions. One of the question was why Palestine's application is being delayed, ostensibly to consider legal issues. The Committee could have met on October 5 -- the experts, they said, were a different set from those on Security Sector Reform -- but instead it was put off to Friday. South Sudan's application was quickly approved, despite contested borders. Here, there will be some "update" in a week; sources predict no Council action for at least three weeks, referring to the first stage of the Middle East Quartet's September 23 announced process. On Friday morning, Inner City Press was told it could not remain even down the hallway from the Palestine meeting in Conference Room 7. Concerned about the difference, Inner City Press at Friday's UN noon briefing asked UN Secretary General Ban Ki-moon's spokesman Martin Nesirky about the "blackout" of the meeting, including the sign not mentioning the topic, and why the press was not allowed even to stand outside the meeting. Nesirky replied that "ultimately the Security Council decides on the format of its meetings." Video here, from Minute 10. 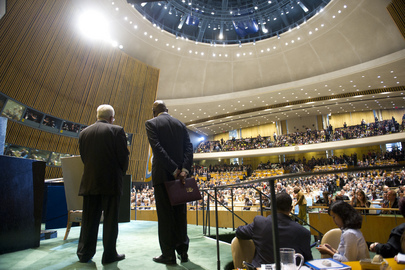 Inner City Press pointed out that the decision to bar the press even from outside the meeting room was not a matter of format, nor seemingly decided on by the Security Council, but rather Ban's Secretariat. Nesirky insisted that "the Security Council determines its own working methods." Some note that October's Security Council President Nigeria, which has indicated it would not vote yes for Palestine's membership in the UN, put out a notice that for SC Program, "There are no scheduled meetings for Friday, 7 October 2011." And perhaps that explains the Journal's silence too. But Nigeria doesn't run the electronic signs outside UN conference rooms, and doesn't control the UN Secretariat's Security -- for which Ban apologized, too quickly many feel, to Turkish prime minister Erdogan after a dust up that left three UN Security officer injured and hospitalized. But that's another story. In the face of these obstacles, Inner City Press is continuing its reporting on the obstacles thrown forward inside the blacked-out meeting -- watch this site.